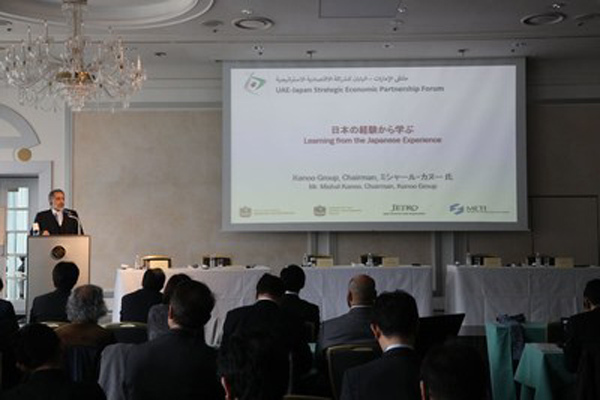 A high-level delegation headed by the UAE Minister of Economy, Eng Sultan bin Saeed Al Mansoori, participated in the UAE-Japan Strategic Economic Partnership Forum, which was recently held in Tokyo, Japan. Mishal Kanoo, chairman of The Kanoo Group (UAE & Oman) participated in the forum, said a statement. Kosaburo Nishime, Japanese State Minister of Economy, Trade and Industry, welcomed the UAE delegation, it said. The recently concluded forum was attended by key UAE government entities and Japanese officials that included Abdullah Bin Ahmed Al Saleh, undersecretary of the Ministry of Economy for Foreign Trade Affairs; Khalid Omran Al Ameri, UAE Ambassador to Japan; Hiroyuki Ishige, chairman and chief executive officer, Japan External Trade Organization (Jetro), together with senior management of select major public and private business sectors including The Kanoo Group, it added. In cooperation with the Department of Economic Development - Abu Dhabi and the UAE Embassy in Tokyo, the official mission was organised in line with the Ministry's efforts to further strengthen bilateral relations between the two countries and to explore investments opportunities. The programme kick-started with a message about ‘The Impact of Abenomics on Japanese Economy and its Issues’, addressed by Atsushi Nakajima, chairman, Research Institute of Economy, Trade and Industry (RIETI). It was held at Japan External Trade Organization (Jetro), a Japanese government-related organisation that promotes mutually beneficial trade and investment relations between Japan and other nations. Mishal Kanoo delivered his keynote speech titled, ‘Learning from the Japanese Experience’. In his message, he stressed his admiration to the Japanese key attributes such as hard work, honesty, cleanliness, excellent work ethics and efficient environmental policies, among others, which are vital qualities towards partnership. He also introduced The Kanoo Group and possible expansion opportunities. Furthermore, he gave emphasis on reinforcing The Kanoo Group's partnership and economic relations with its Japanese affiliates. At present, group is a joint venture partner of the Japanese giant, Mitsui O S K Lines, one of the world's largest global multimodal transportation companies. One of the highlights of his trip was a meeting with Yuriko Koike who currently serves as the governor of Tokyo, the city's first female governor, and previously the Minister of Defense in the cabinet of Prime Minister Shinzo Abe. Additionally, Mishal Kanoo along with Mahmood Mian personally met Yoshiyasu Fujiwara, president of TLV Co, one of the world's leading manufacturers of steam engineering products. For over 20 years, Kanoo Oil & Gas, a member of The Kanoo Group has been representing TLV as one of its product principals. Kanoo, as part of the UAE delegation visited the Tokyo Port, one of the largest Japanese seaports, and one of the largest seaports in the Pacific Ocean; the Mori Building Company, a Japanese leading property management firm established in 1955; and the Foodex Japan 2018, Asia's leading international food and beverage trade show, and other top Japanese firms.